CrystalClear Strips are suitable for both automatic and manual crystallization, including screening and optimization. They are particularly useful for very small volume drops, including 100 + 100 nl drops, or below. The optics are extremely good, and drops seldom touch the side-walls because the sample chambers are relatively large. Note that all sample chambers are at the same height to within 0.1 mm, which facilitates both dispensing and viewing. Droplets (approximately 50 nl to 4 microlitres) are dispensed on a shelf on one side of each well. Around 50 to 100 microlitres of solution is placed in the main reservoir. Strips are sealed with tape. Losses by evaporation though the body of the strip and the tape are around 0.25% of the reservoir per day, which is comparable to Linbro trays. Crystal Clear D: The original version, CCLEAR-D/1, has depressions on the shelves. This prevents liquids that tend to wet the plastic from running down into the reservoir. 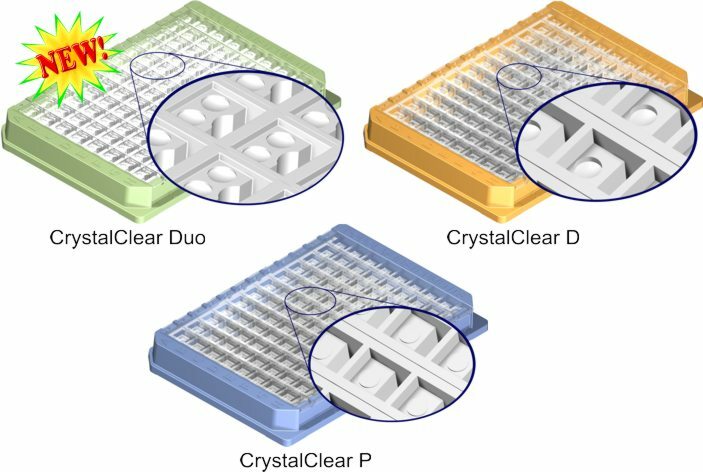 Crystal Clear P. The platform version, CCLEAR-P/1, has a circular platform on the shelf on which samples are placed. This gives improved viewing and is especially suitable for samples containing detergents such as membrane protein samples. The edge of the platform has a "pinning edge" which prevents liquids from running down into the reservoirs. Note: the spacing between strips is 9.0 mm (the regular SBS spacing). However, the spacing between sample chambers along a 'D' and 'P' strip is only 8.45 mm. Therefore, if you want to use a multichannel pipette to fill either the reservoirs or the sample wells of the D or P strips, use a 12-channel pipette rather than an 8-channel pipette. CrystalClear Strips were designed and are manufactured by Douglas Instruments. They can be obtained from Douglas Instruments, Hampton Research, and other distributors. Tip: put normal cheap office tape on each strip immediately after dispensing to prevent evaporation. Replace this tape with permanent sealing tape when the experiment is finished. Douglas Instruments is running a competition for the best use of it's products including the Crystal Clear Strips and the Douglas Vapor Batch Plate.